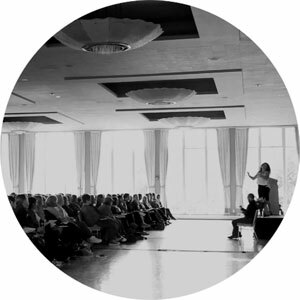 Whether you invite 20 people or 2,000, we are able to provide a keynote talk for your community, workplace, or conference. There is no limit to the number of attendees. Participants from any and all professional disciplines or life circumstances will benefit. Laura van Dernoot Lipsky’s talks offer a compelling mix of personal insight and cutting-edge research. Filled with stories, quotes (by wise men and women from Bob Marley to Wangari Maathai), and countless New Yorker cartoons, they have been widely praised as both engaging and effective. Laura’s concept of stewardship is based around the idea that a deeper understanding of trauma exposure and the tools for navigating systems will enable people to do their work better. Her keynotes often touch listeners to the core, but she consistently inspires audiences with laughter and a profound sense of hope. Many participants leave these sessions with a renewed sense of purpose and fresh optimism about the possibilities for transformation. I have been in the criminal justice system for 36 years — as a District Attorney for 17 and a judge for 19. I have regularly witnessed others relate the trauma they have experienced first hand. Laura van Dernoot Lipsky presents compelling evidence of the impact witnessing trauma has on the observer. I recommend her work to anyone engaged in criminal justice work as well as any other profession that brings that person into close encounter with the trauma suffered by others.